This mosaic shows extraordinary details of tectonic deformation in the fractured south polar region of Saturn's moon Enceladus, where jets of water ice spray outward to form Saturn's E ring. The images were captured by NASA's Cassini spacecraft. 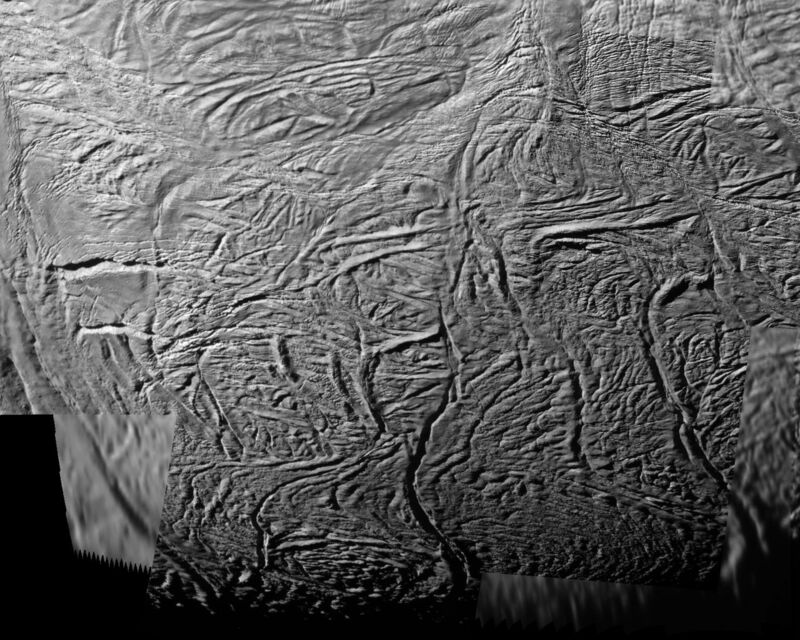 This image and others like it from the close flyby of Enceladus on Nov. 21, 2009, are among the best visible light images Cassini will capture of the region around the "tiger stripes," the fissures that spray icy particles, water vapor and organic compounds, before the moon's south polar region enters winter darkness for the coming years. 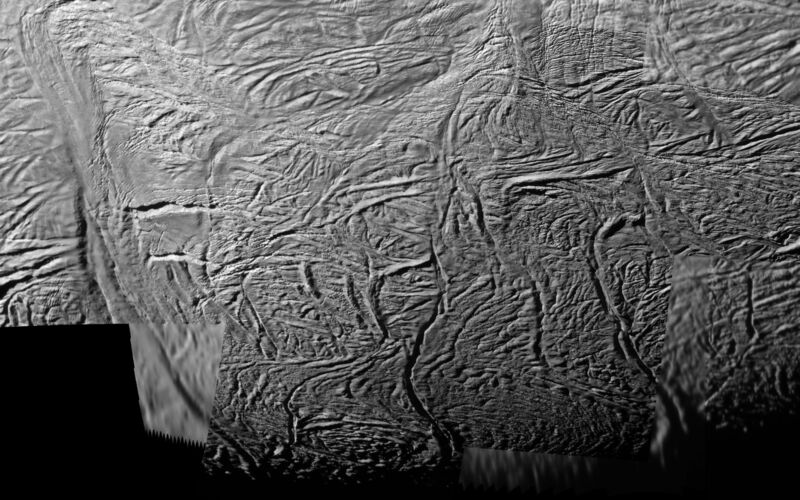 Cassini scientists will use these new images to study geological activity associated with the tiger stripes and their effects on the surrounding terrain. See PIA11687 and PIA11688 to learn more. In this view, three prominent tiger stripe fractures extend from the bottom center of the mosaic upwards toward the center. From left to right, they are Alexandria Sulcus, Cairo Sulcus, and Baghdad Sulcus. Across the middle of the image, near the northern end of the tiger stripes, a conspicuous pattern of parallel 90-degree bends has formed. The bends curve along similar paths, that is, starting in a direction parallel to tiger stripes at one end and turning perpendicular at the other. Changes in the nature of regional tectonic stresses presumably cause the bends and narrow ridges to form perpendicular to tiger stripe direction. Analyzing systematic tectonic patterns like these throughout the south polar region may lead to an understanding of the forces and mechanism that drive Enceladus' activity. See PIA11114 and PIA08386 to learn more. This mosaic was created from six images that are also part of a larger mosaic (see PIA11685). The images were re-projected into orthographic map projection. 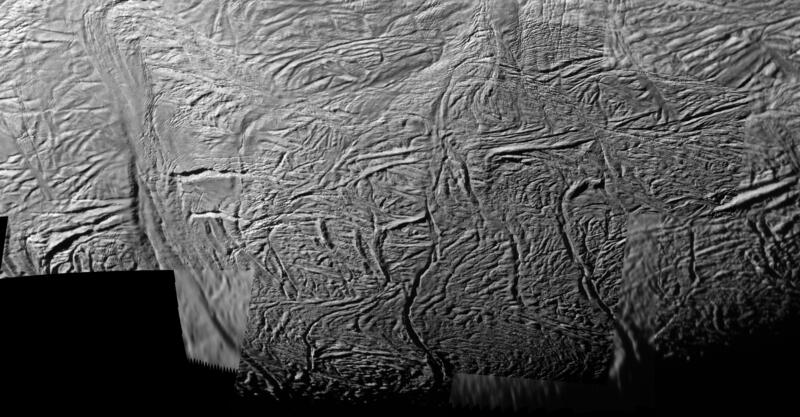 This view looks toward south polar terrain of Enceladus (504 kilometers, 313 miles across). This view is centered on terrain at 73 degrees south latitude, 54 degrees west longitude. 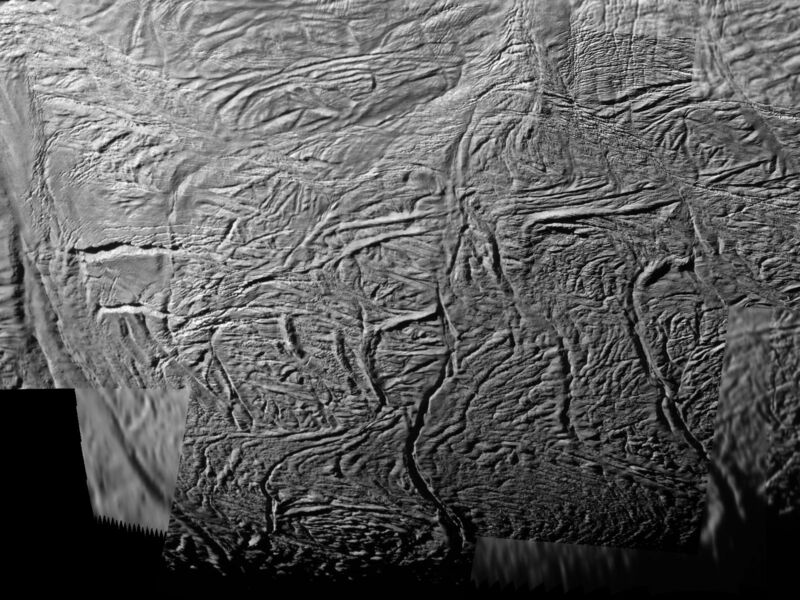 The images were obtained in visible light with the Cassini spacecraft narrow-angle camera on Nov. 21, 2009. The view was obtained at distances of approximately 3,200 kilometers (2,000 miles) to 7,000 kilometers (4,300 miles). Image scale is about 18 meters (58 feet) per pixel.